On 3 March 2009, Sri Lankan team became the target of assassins but luckily respected guest players were saved, however many policemen deployed for their security embraced martyrdom. 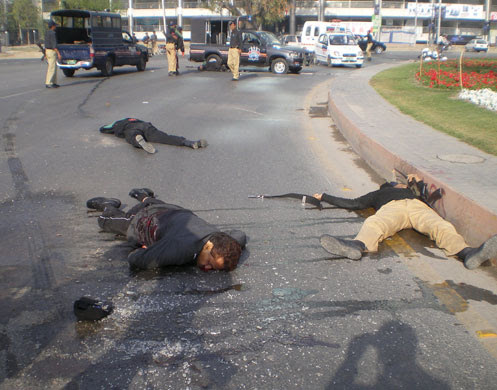 On 22 May 2009, terrorists attacked GHQ Islamabad with such a way that in spite of presence of red alert security they managed to enter a building near the main gate. On the night of23 May 2010, terrorists entered into Mehran Naval Base and destroyed P3C-Orion aircrafts that had the capability to detect and destroy submarines in deep waters. On 16 August 2012, attack over Kamra Airbase (few miles away from Islamabad) was thwarted. Kamra Airbase is important due to reassembling Mirage fighter planes and JF-17 Thunder. On 15 December 2012, terrorists attacked PAF Airbase Peshawar and attempted to destroy Saab 2000, ERIEYE AEW & C aircrafts important for air warning and surveillance. On the 14th of June 2013, Quaid’s residency in Ziarat was burnt to ashes and on the same day innocent students lost their lives in a terrorist bomb blast. In the same way on 23 June 11 mountaineers (climbers) belonging to China, Ukraine and Russia including 2 Pakistanis out of 46 were murdered by the terrorists. Although their countless terrorist attacks which Pakistani nation had to face but few mentioned above targeted those areas that meant a symbol of Unity, Security and Defense as well as pride of Pakistan. 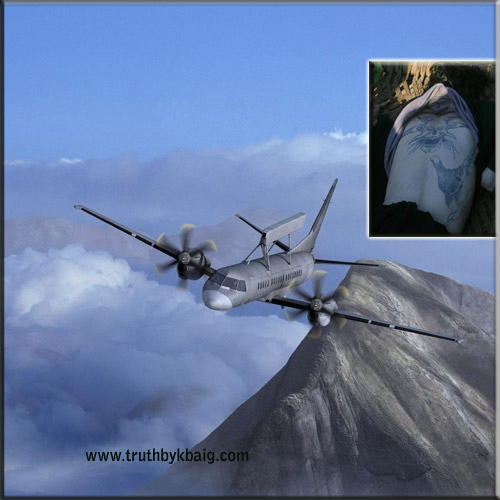 The question arises that those terrorists claiming to be Taliban had the capability, knowledge, training and strategic planning to execute their attacks over these national assets; how they had known the use of these latest AWACS airplanes; had Taliban submarines or Fighter jets that they needed to suppress air defenses of Pakistan? I do not think they had this capability. 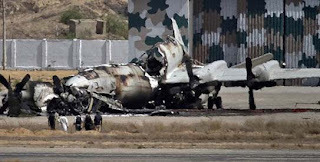 Leaving aside the terrorists being used by the enemy, only expert Generals have the capability to plan and execute such attacks and only experts in warfare can estimate the use or importance of these air-crafts costing to billions of rupees. Our TV Channels and newspapers keep deceiving us through their propaganda that these millitatns hiding in mountains and ruins are capable to do anything. Who is providing them latest weapons? Who is training them and specifying planning targets for them? Why our media, gurus of media ever dared to discuss all these in their talkshows or columns? Just because they are aware that if such discussions are started nation would become aware of foreign hands behind these terrorists. Moreover, our media deceives us that terrorists want Shariah or Islamic Law in Pakistan (that is why terrorists had never targeted any Music Centre, Cinema, TV Channel, Foreign staff of NGOs (except those foreign tourists from friendly states to defame Pakistan). So after every terrorist attack in Pakistan international media starts propaganda that Pakistan has become safe-heaven for religious extremists, Pakistani nuclear assets may fall in the hands of extremists anytime. If this happens peace of world would be at stake. Are those attacking defense installations and Quaid’s residency want imposition of Islamic Shariah or want to reinforce propaganda of enemies of motherland by killing innocents. Ask any illiterate person that if defense of Pakistan is sabotaged would this help in imposition of Islamic Shariah? Will weak Pakistan would be in favor of anti-Islamic elements or those who want to impose Shariah? The only answer one will get is that Weak Pakistan will only benefit eternal enemy i.e. India. On the one hand India is infiltrating its terrorists in Baluchistan under cover of separatists, and Indian trained terrorists are jolting KPK with suicide bomb blasts while on the other hand India is also staging the drama of friendship and AMAN KI ASHA. The most painful aspect of the conspiracy is that our pro-Indian and anti Two Nations Theory elements (traitors in proper words) blame Pakistani forces and secret agencies of Pakistan. On the international level Pakistani forces and ISI are target of propaganda due to the Jewish-Hindu nexus. USA and Europe’s support to Indian propaganda for their interests is something understandable but pro-Indian enlightened, moderated intellectuals, journalists and so-called analysts should consider sacrifices of Pakistani forces and in spite of lost of lives our soldiers are still fighting terrorist stanchly. Not only this from return to Baluchistan during the address to parliament Federal Interior Minister in spite of condemning terrorists blamed intelligence agencies and forgot that during the reign or previous govt. thousands of agents of Black Water were provided visas through Pakistani ambassador Hussain Haqqani without any security clearance from intelligence agencies. The reality of these visas and agents was disclosed when two Pakistanis were murdered cold bloodily in the clear daylight but still out leaders blame intelligence agencies. Bitter reality is that our leaders and politicians living in fort like houses where pets are fed with imported food had never courage even to visit to express solidarity with the families of those who sacrificed their lives for security of motherland and visit soldiers fighting against terrorism to encourage them that they are not alone but whole nation stands besides them. This something that is to be done by our elected President, elected Prime Minister and elected Cabinet. Look at the example of Afghanistan; quote the name of a single country whose army is deployed even few in number but their notable state officials had not visited soldiers to encourage them? “The Pakistanis have disturbed the internal peace in India and my ‘Suicide Squad’ is doing same thing in Pakistan. We have started this program on our own because country needs such youth to tackle terrorism. Today the country is being destroyed by ISI of Pakistan. And we have to do something about it. So we feel that these suicide squads are answer for the Pakistanis”. Alas! Pakistan should have protested on international level when these confessions of on duty Indian army officers were published. Our ambassadors serving in foreign countries had tried to lend the attention of media of their respective countries towards these confessions. Our Free Media had unanimously raised voice against the Indian aggression and open confession of being a terrorist state. If a campaign had been run so that these Indian officers confessing their involvement in terrorism had been brought to justice in international court for war crimes than the situation of South Asia regarding peace and prosperity would had been much more different. But we practiced criminal ignorance over confession of Indian army officers; so if India had taken benefit from our ignorance than we have no right to blame India. Date : 01 July 2013.